From paint sales to record sales, the past couple of years have brought a drastic change in lifestyle for, Lee DeWyze, season 9 winner of American Idol. DeWyze grew up 40 minutes outside of the Windy City of Chicago and lived a pretty normal life. 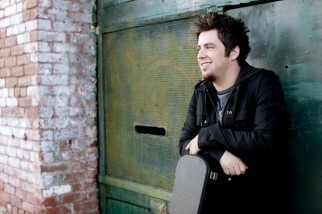 A rocky senior year of high school had lead DeWyze to his passion of music. Playing nearby house parties and surrounding clubs Lee garnered a loyal following. His version of, “Aint No Sunshine”, was a hit at the Chicago audition of June of 2009. During Hollywood week Lee shot up in the top 5. In the finals DeWyze beat out the effervescent Crystal Bowersox to become season 9 champion. With tones of John Mayer, Simon & Garfunkel, and Ben Harper you can fully intend on a night chalk full of dreamy ballads and toe tapping rhythms.